Bob Kemerait, UGA Extension plant pathologist, is urging cotton farmers to be aware of bacterial blight this year. University of Georgia Cooperative Extension plant pathologist Bob Kemerait is advising cotton producers to stay on alert for bacterial blight as the season rolls on. Farmers who work in fields with a history of bacterial blight should be on high alert. Bacterial blight, which is also known as angular leaf spot, causes water-soaked lesions on cotton bolls. The disease has become more problematic over the past two growing seasons. High rates of defoliation and boll rot were reported in the most affected areas. 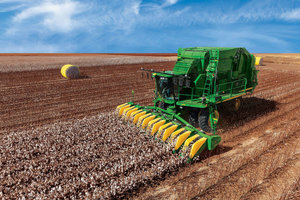 Kemerait is advising producers to consider planting resistant varieties of cotton. He says farmers can also rotate affected fields away from cotton for at least one season to minimize risk; infected seed is known to spread bacterial blight. However, bacterial blight is not the only challenge producers face. Root-knot nematodes have also threatened Georgia cotton production. They are known to stunt plant growth. Kemerait advises farmers not to lose sight of other challenges and diseases this growing season.